Medieval Sticky Wall Inflatable Gear up with a sticky suit than get ready to storm the castle. Once participants reach the end, an oversized inflatable Velcro wall catches them in mid-­‐jump. How high can you jump? Make sure to tip the court jester in case you need help getting down. This one-of-a-kind inflatable attraction features brick artwork, battlement detailing at the top of the unit, along with three-dimensional torches flanking the sides. 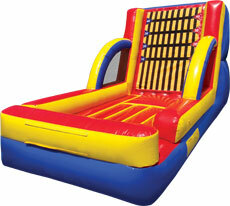 This amazing 15-foot inflatable attraction is sure to capture the attention of guests- young and old!